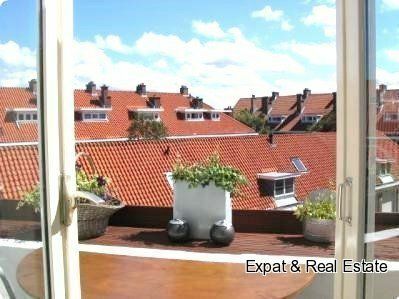 Very spacious and bright 3/4 room corner apartment behind the Circus Theatre in Scheveningen. Located on walking distance of the beach, dunes and the lively boulevard of Scheveningen. Particularly favorable is also the location near public transport, shops, tennis parks, sports complex and several parks. Access through open porch, staircase which is located on the top floor. L-shaped hallway with access to the spacious living/dining room (ca. 7.00 x 4.00 m) with fireplace, wooden floor and access to balcony, bedroom at the rear (approx. 3.40 x 2.20 m) with access to rear balcony. Modern bathroom with shower and sink. Separate toilet, 2nd sleep study room (ca. 4.00 x 1.90 m) on the front. Close modern kitchen (approx. 3.40 x 2.40 m) fitted with various appliances namely: oven, gas hob, extractor fan, fridge-freezer, dishwasher. Also from the kitchen access to rear balcony.